The City of Ludington has posted a map for three different city walks at various locations. The colors on this map match the colors on the kiosk maps, and I have used their designated names, but this is confusing. The red Waterfront Loop is not a loop trail, and the yellow Waterfront Walkway Loop does not appear on the kiosks. However, this route existed previous to the placement of the kiosks and is the best marked of the routes. This very short hike follows the channel and then loops back to the Marina parking on sidewalks. It is concurrent with the Waterfront Loop, and Beach Loop for part of its distance. If you time your walk right you can see the ferry come or go. The description begins at the corner of Ferry and Loomis Streets. This is a trail for strolls and watching the water and boats. Forget the time. Walk south along the Marina. There are several benches for resting or viewing the boats in their slips. The trail makes a slight jog right and then left to reach the channel. You can now get a near head-on view of the carferries docked in Pere Marquette Lake. Turn right and walk between the railing and a row of large boulders. In the middle of this southern leg you will make a jog around the Coast Guard slip in front of the Station. Reaching the small pier at the end of the channel, turn north (right). You can walk out on the pier as a side trip. There is a small park with a pavilion, picnic tables and benches on this corner. Jog right and then left to skirt the parking area. As you approach Loomis St. you will pass a ship's propeller. There are public rest rooms (may be closed in the winter) here. Turn right again on Loomis Street and follow the sidewalk past the fish cleaning station, and through a residential area to complete the loop. Access- parking along the Marina on S. Ferry St. or at the W. end of Loomis in a large parking lot. Restrictions- No bikes, skateboards, rollerblades, roller skates, or dogs along channel side. Distance and time- 0.6 mile, it can be walked in 10 minutes, but this is a trail for leisurely evenings, gull watching, and the gentle sound of waves. Spend at least 20 minutes. Trail Markers- are blue footprints painted on the sidewalk with the words "Walk Loop"
Treadway- paved, stable footing all the way in good weather. Storms, ice and snow may close pathway (see restrictions). Ecosystem- urban pathway along channel to harbor and Lake Michigan. See the carferries at their docks, or better yet, time your walk to see them come in or go out. A most impressive sight! 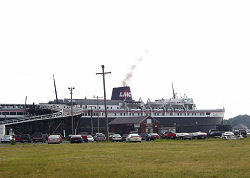 See more at Lake Michigan Carferries There is also a ship's propeller to see along the walk. This is the longest of the walks, is not a loop, and is not officially continuous. It is concurrent with the Waterfront Walkway, and Beach Loop for part of its distance. The description begins at the south end of Stearns Park at the corner of Court St and Stearns Drive. Although this is where the signs say the trail begins, one of the kiosks with the map is actually a block north near the beach sidewalk through Stearns Park. If you want to see the interpretive panel there about Lake Michigan Beach, Epworth Assembly, and the City of Flint, begin your walk a bit farther north. Then follow Stearns Drive south across Ludington Avenue. For the block just south of Ludington Ave the sidewalk is just a paved lane of the street. Enter the Loomis St Boat Ramp parking area and follow the sidewalk around the east (past a ship's propeller) and south edges till you reach the edge of the seawall at the SW corner of the parking area. There you join the Waterfront Walkway which is marked with its own sign. Continue south with a small park on your left to the channel wall. (You can turn right and add a short leg to your walk along this pier. Step up, this pier is not barrier free). Turn left and walk between the blue fence on the channel side, and large rocks, making a small jog at the Coast Guard Station. When you reach the City Marina, turn north on Ferry St and follow the edge of the marina. Leave the Waterfront Walkway turning east on Loomis St and then south on William St. Enter Waterfront Park. There is an interpretive panel here about "Baseball and Boating. "(You can add another out and back leg to your walk by turning west (right) and going to the end of this peninsula to see a lifeboat from the City of Flint), other wise, proceed south through the park following the west edge of the park along the seawall. You will pass the "Reflections" and "Spirit of Ludington" sculptures and several small canopied picnic areas before reaching the southern tip of this peninsula. Follow the sidewalk and make an abrupt turn north east, now on the east side of peninsula. Pass the "Lumbering Era" sculpture and then turn east along the south edge of the park. Follow sidewalk along the north side of Harbor View Marina. This is private, and the picnic areas here are not for public use. When you reach Rath Avenue (the next street) there is an interpretive panel about "Carferry History" Turn south (right) and follow this to the end, past the carferry docks. This section of the trail officially ends here. You can continue the walk on city streets and sidewalks to reach Copeyon Park. This portion of the walk is now fully accessible due to sidewalk upgrades and the 2013 rebuilding of the Washington Avenue Bridge. Walk east on Dowland Street (for those in wheelchairs, both sides are barrier free, although a tree intrudes into the sidewalk space on the south side. If barrier-free treadway is not required you can jog south from Dowland on George St to Laura St and then south across gravel to Lake St to follow along the Washington Avenue channel and see some older factories, warehouses, etc. They are moderately interesting, just because this is the oldest section of the city.) through 4th Ward, a very old section of the city, to Washington Avenue. Turn south down a moderately steep hill, and cross the bridge over the channel to the Washington St Marina. Climb back up a moderately steep hill and turn south on sidewalk beside Lakeside Drive. After this, the accessibility for wheelchairs is poor due to a steep hill down to the water. Go down stairs and turn right to reach the water and find sidewalk at the lakefront which passes beside Pere Pointe Condominiums. Enter Copeyon Park near the boat launch. Restrictions- No bikes, skateboards, rollerblades, roller skates, or dogs along waterfront. Distance and time- 1.8 miles from Stearns Park to the carferry docks, 0.6 mile on city streets to connect to the Copeyon Park segment, 0.4 mile Copeyon Park segment. One hour (one way 2.8 miles total) at a moderately brisk pace without stops. However, stops and enjoyment of the scenery is recommended! Condition of Marking- You may encounter an occasional very old and worn set of red footprints painted on the sidewalk in the sections not concurrent with the older yellow loop. Treadway- paved, stable footing all the way in good weather. Some wooden sections in Waterfront Park. Storms, ice and snow may close channel pathway. Ecosystem- urban pathway along channel to harbor and Lake Michigan, city streets. See the carferries at their docks, or better yet, time your walk to see them come in or go out. A most impressive sight! 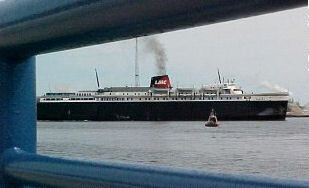 See more at Lake Michigan Carferries. Sculpture garden at the Waterfront Park. This hike proceeds toward town on city sidewalks past the City Park and then returns along the channel. It is concurrent with the Waterfront Loop, Old Waterfront Loop, and Downtown Loop for portions of its distance. If you time your walk right you can see the ferry come or go. The description begins at the south end of Stearns Park at the corner of Court St and Stearns Drive. Take Court St east to Lakeshore Drive, and go south one block to Ludington Ave. Turn east (left) and go five blocks, passing motels, early 20th Century residences, and the City Park. Just before entering downtown, turn south on William St. Go one block, and turn west on Loomis St. along the north side of the City Marina. In three blocks join the Old Waterfront Loop and turn south on Ferry St. At the channel turn right and walk between the railing and a row of large boulders. In the middle of this southern leg you will make a jog around the Coast Guard slip in front of the Station. Reaching the small pier at the end of the channel, turn north (right). You can walk out on the pier as a side trip. There is a small park with a pavillion, picnic tables and benches on this corner. Jog right and then left to skirt the parking area. As you approach Loomis St. you will pass a ship's propeller. Continue north on Stearns Drive (sidewalk is a paved area at the edge of the street), cross Ludington Ave and join regular sidewalk, continuing north to complete the loop. Treadway- paved, stable footing all the way in good weather. Some wooden sections in Waterfront Park Storms, ice and snow may close channel pathway. Ecosystem- urban pathway near City Park, residential streets, and along channel to harbor and Lake Michigan. This hike circles through downtown Ludington, and through Waterfront Park. It is concurrent with the Waterfront Loop for part of its distance. 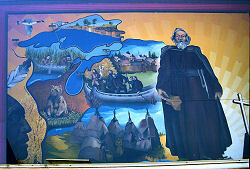 You can see several of Ludington's famous murals on this walk. The description begins at Waterfront Park. From the public parking area go north on William St past the Pere Marquette Memorial. 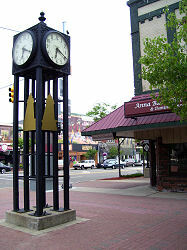 Reach Ludington Ave. and turn east (right) and enter downtown Ludington. There is a moderate uphill in this first block. Pass many cafes and small shops. When you reach James St at the center of downtown, turn south (right). 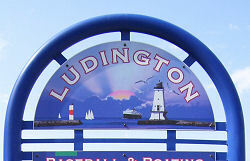 You are now entering the section of Ludington which was its original downtown. There are still many small businesses located along this route, and you will pass several murals. Continue south for six blocks to Dowland Street and turn west (right). The carferry docks are directly ahead of you. After just one block, turn north again on Rath Ave. and go three blocks. Watch for a turn to the west (left) beside the Harbor View Marina. There is an interpretive sign here on "Carferry History." You pass between the condos and this private marina (picnic areas in this short piece are not open to the public), and enter Waterfront Park. Follow the sidewalk around the north side of Harbor View Marina, past the "Lumbering Era" sculpture to the south end of the park's peninsula. Turn sharply north and continue on the sidewalk along the seawall past several canopied picnic areas, and the "Spirit of Ludington," and "Reflections" sculpture. Return to the parking area. Access- paved parking at Waterfront Park or on many city streets, or downtown in lots behind businesses on the north side of Ludington Ave.
Restrictions- No bikes, skateboards, rollerblades, roller skates on the walkway in Waterfront Park. Distance and time- 1.5 miles, it can be walked in 30 minutes, but take time to enjoy the sights. Treadway- paved, stable footing mostly on city sidewalks. Cement, some brick in downtown. Dowland St section is oldest sidewalk and sometimes rough. Swimming- Lake Michigan swimming from South Pier Beach is located on the south side of the Ludington Pier, and north of the Loomis Street boat launch. Dogs- The city provides about 20 feet of beach where dogs are allowed, on leash, on the south side of the Loomis Stree Boat Launch. Pere Marquette Memorial - This has been moved to White Pine Village. This is a painting honoring the life of Father Marquette, located on William St., between Loomis and Filer. "Pere Jacques Marquette - With the cross held before his eyes the great missionary explorer died May 18, 1765 at a spot across the Pere Marquette Lake. The exact location may be seen on the horizon to the left of this memorial. Pere Marquette Memorial Association, Dedicated July 4, 1953." Interpretive Signs- Along the way you pass blue kiosks about the Lake Michigan Beach, Epworth Assembly, and the City of Flint which ran aground in the 1940 storm. Also, "Baseball and Boating," "Vintage Ludington" and "Carferry History." The entire back of the "Lumbering Era" sculpture is interpretation on that topic. There is a sign about Ludington's Petunia Parade on the west side of the City Marina. Handicap Accessibility- These routes are completely accessible, but there may be a few rough spots or bumpy curb ramps. 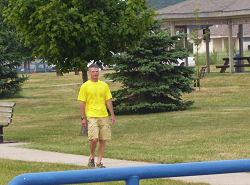 Rest rooms at Stearns Park, Ludington City Park, Copeyon Park, and Waterfront Park are accessible. The section from the carferry docks to Copeyon Park is technically barrier free and would be fine for someone in a wheelchair or scooter except for the final hill into Copeyon Park. (see Waterfront Loop for details. Stearns Park-Take US 10 west into Ludington. This becomes Ludington Avenue. Continue west until the last street before the lake, which is Lakeshore Drive. Turn north, and go 0.5 mile to the entrance of the park, on your left. Stearns Drive is one way, you cannot enter from the south, although there is limited parking at the end of Ludington Avenue. Loomis St Boat Ramp- Take US 10 west into Ludington. This becomes Ludington Avenue. Continue west until the last street before the lake, which is Lakeshore Drive. Turn south and go one block to Loomis Street, turn left into the parking area. Attendant at booth in summer, parking is free, fee is only for boat launch. 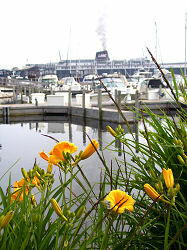 City Marina- Take US 10 (Ludington Avenue) through downtown Ludington. Turn left on Ferry Street and go one block to the Marina parking just south of Loomis Street. Waterfront Park- Take US 10 west into Ludington. This becomes Ludington Avenue. Continue west through downtown to William Street. Turn south (left). Go two blocks and enter the park. Copeyon Park- Take US 10 (Ludington Avenue) into Ludington. Turn south on Washington Avenue (stoplight). Continue through the blinker light at Dowland, go down hill, cross the bridge, go up hill, and the entrance to the park goes steeply downward to the right, just past 2nd St.